Our Scheduling tool allows for you to present a select group of applicants with a set of available time slots and allow the applicant to sign up for one of those time slots. It is most commonly used in order to schedule interviews; for example, if part of your review process involves a prospective recipient interviewing with a member of your organization or a faculty member of your university. For the purposes of this article, we will continue to use interviewing as our example. If you think you have a use case other than interviewing that could benefit from usage of the scheduling tab, please reach out and let us know, we'd be happy to assist! Now let's dive in. Just like reviewers, your interviewers will all need to be members of the workspace. 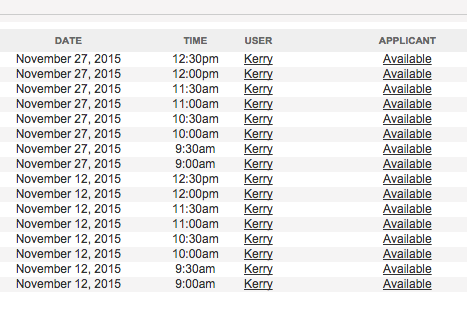 They will not necessarily enter the workspace, but their available time slots must be linked to a user account. 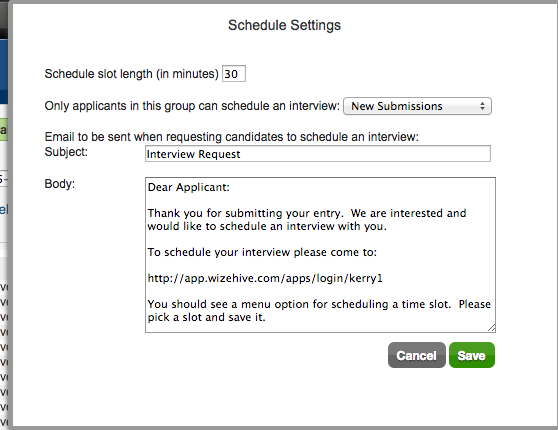 On the Settings button in the top right corner, you can edit the length of time of the interview, which folder should have scheduling access, and what email will go out to applicants to notify them that they should schedule interviews. In the above example, only the New Submissions folder would see the Scheduling option on their main menu when logging in to their application. The time slots would be 30 minutes in length. The email body will not be sent when clicking Save, but rather, when pressing the button on the main Scheduling page which says Sent Interview Invitations. Your interviewer should come into the workspace in order to indicate what times/dates he/she is available to conduct interviews. If you would prefer, you can also log in with the credentials you created for your interviewer and enter the times on his/her behalf. This would be accomplished by clicking the Add Available Time button in the top left corner. Once clicked, your interviewer (or you, on your interviewer's behalf) have the opportunity to indicate a time range on a specified date. Once you click Save, the time slots will appear. To add time slots on additional date, simply update the Date, Start Time, and End Time, and click Save again. The new times will be added together with the old times. 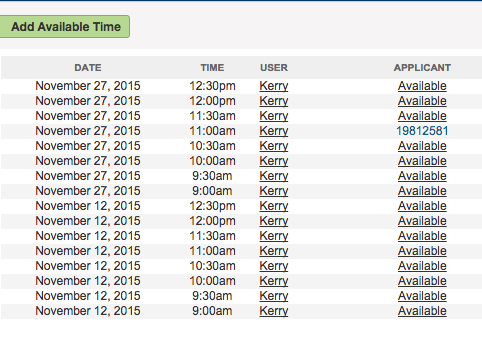 Once interviewers have indicated available times, they will show up on the Scheduling tab in a grid. 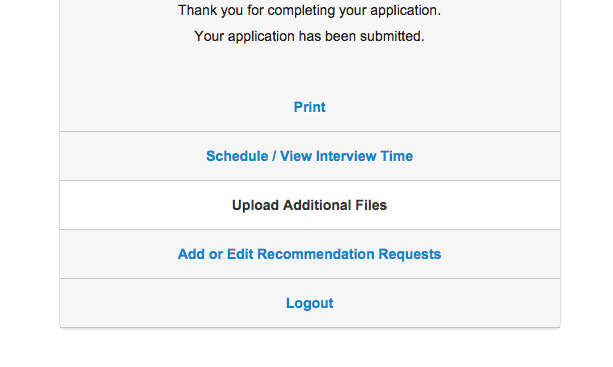 The email to applicants notifying them of interviews is editable in the Settings page. If your interviewers are scheduled, it's time to send that email. Click Send Interview Invitations on the main page. The invitation will only go to the folder that you indicated in the Settings screen. WizeHive will confirm that you want to send the email. Applicants will return to the application URL where they originally created their application, and will now see an additional button on the main menu that says Schedule / View Interview Time. The text of this button is customizable in Template Text. The applicant would click that button and will see all available time slots; i.e., slots that were not already selected by other applicants. Clicking Schedule would schedule this time. The applicant would see this on-screen confirmation, in addition to an email confirmation. 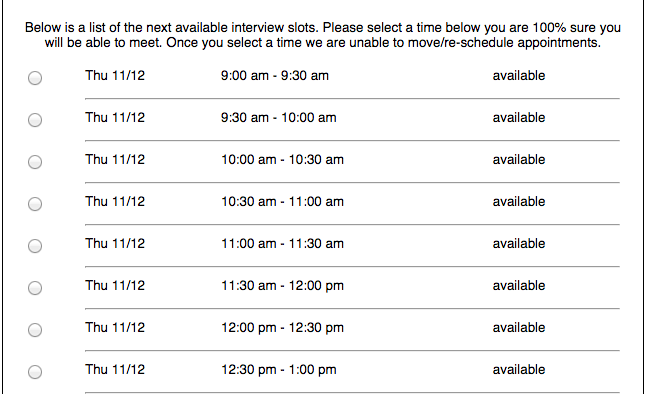 As interviews are scheduled, the available time slots adjust so that no two people schedule at the same time. The scheduling grid will also update. As you can see below, the applicant from above is now indicated as having taken the November 27 11am time. Make sure that the interviewers who have scheduled time slots are also assigned to the corresponding folders in the Assignments tab.